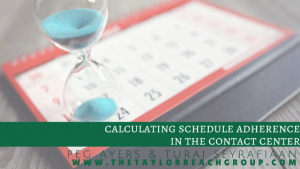 Calculating Schedule Adherence in the Contact Center | The Taylor Reach Group Inc. Definition: The percentage of time your agent was exactly where they were scheduled to be. Example: An agent is scheduled to work 8 hours (480 minutes) and is five minutes late going to break and five minutes late returning from break, for a total of 10 minutes out of schedule adherence. Agent’s schedule adherence is (480-10)/480 X 100 = 98%. Schedule adherence is generally calculated by your scheduling/WFM system. 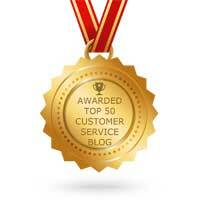 You want to be able to easily see when an agent is not where they’re scheduled to be. If an agent should be available but is on break, they are out of adherence, and this should show up on your scheduling system’s Real Time Adherence (RTA) screen. If they don’t take their breaks when they’re scheduled, they are out of adherence for that time. This doesn’t mean they took too much time on break, just that they went to break at the wrong time. Your scheduling system is putting breaks where they need to be, and having people go at other times means you don’t have the staff you need available, which is likely to lead to lower customer satisfaction because of longer wait times or handle times. From time to time, Contact Centers put additional emphasis on ‘Adherence to Schedule’ and even provide significant incentives. The idea here is to encourage agents to follow the schedule as it was designed. However, there is a risk in putting too much emphasis on ‘Adherence to Schedule’ as it may take away from the importance of Customer Service! Agents may decide to cut the conversation short in order to be adhere to their exact schedule. It is common for systems to allow “exceptions” to be entered when people are out of adherence for good reasons (for example, going late to break because a phone call went long). This can become cumbersome and lead to a situation where Supervisors or Work Force Management staff spend all their times entering exceptions. You will save time and aggravation if you set a reasonable goal for schedule adherence, perhaps in the low 90s or high 80s, depending on your circumstances. If you assume that schedule adherence won’t be perfect and that long calls and special circumstances will affect everyone equally over time, you can make schedule adherence a useful tool without spending too much time on it.